Hand sanitizer is something I always carry with me. And I have often thought to myself that I should look into how to make my own. How difficult could it be to make your own? It turns out, not difficult at all, especially when all the ingredients are conveniently delivered to you! Disclosure: I am a Simply Oil ambassador and will earn a small commission if you decide to purchase products through one of my links. As always, all opinions are my own. 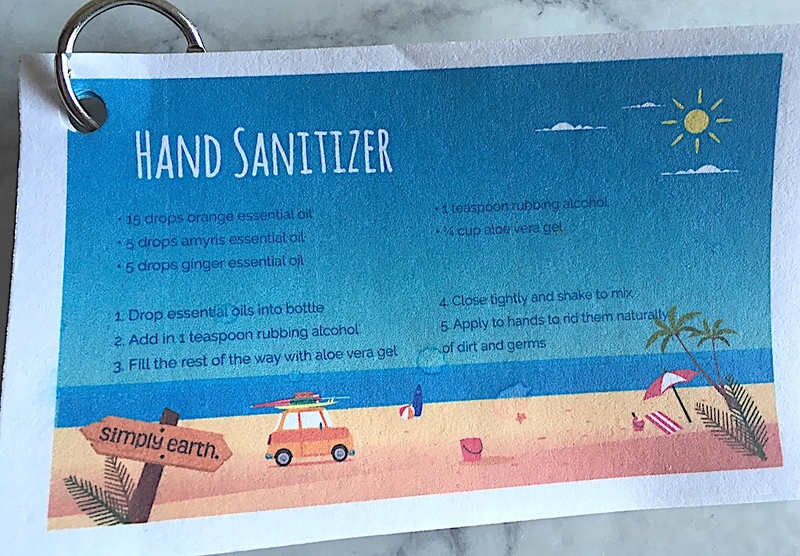 As luck would have it, my most recent Simply Earth* essential oils recipe box included a recipe for a hand sanitizer. All the ingredients for the sanitizer, except for the rubbing alcohol, were included in the box. Drop essential oils into bottle. Add in 1 teaspoon rubbing alcohol. Close tightly and shake to mix. Your hand sanitizer is ready to use! The recipe and the ingredients for the hand sanitizer were part of the July essential oil recipe box that I received from Simply Earth. 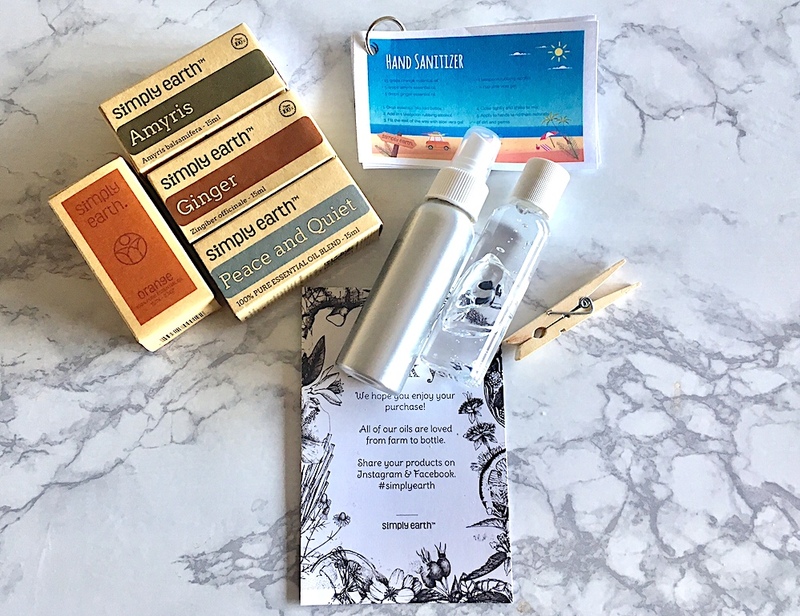 Here is my review of the first Simply Earth essential oil recipe box that I received. Simply Earth* is a subscription box that has a new theme every month. The first box I received allowed me to mix different beauty products, and this box contained products for your home, car and on-the-go. I did a bit of research and found out that prior boxes included ingredients and fun recipes for candles, cleaning products, lip balm, bath bombs and more. In each box, you receive four essential oils, containers, and five to seven recipes as well as recipe ingredients. You can pause or cancel your subscription at any time. You also have the option to buy just one box without subscribing. Additionally, you can subscribe to one box every three months. I really like the flexibility of this subscription service. I love the Simply Earth Essential Oils Recipe Boxes* because the essential oils are 100% natural and can be easily mixed into all kinds of nourishing and natural products. I also like that there are easy recipe cards, but that you can also experiment a bit on your own. I have made several batches of body scrub (one of the recipes from my first box) and have changed the oils I used. I have also mixed a bit of lemongrass oil with a bit of camellia seed oil (both in my first box) and put it into a roller bottle. The smell is very relaxing, and I keep it next to my bed to unwind at the end of the day. A FREE DIFFUSER when you buy an Essential Oil Recipe Box. Questions: Have you ever tried essential oils? If so, what did you use them for? Have you ever signed up for a subscription box? *Disclosure: I received the Simply Earth Essential Oils Recipe Box for free. As always, all opinions are my own. 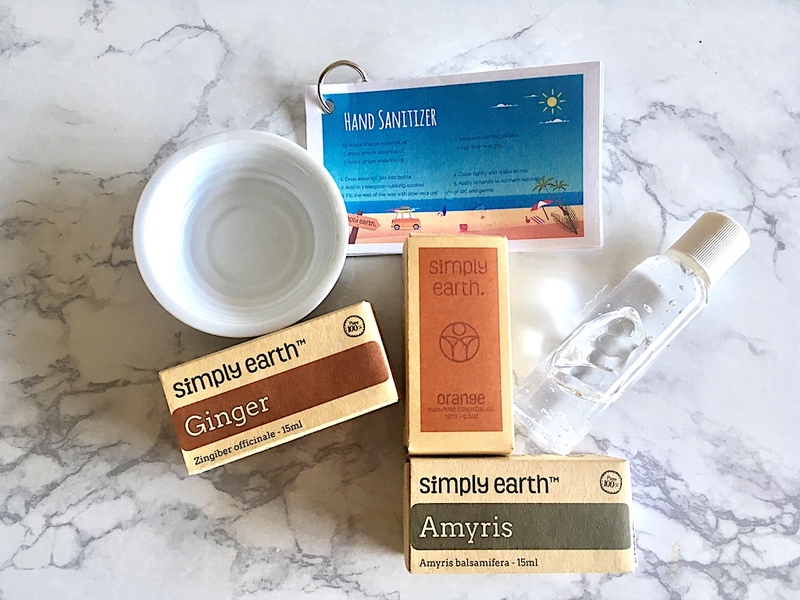 I am also a Simply Earth ambassador and if you sign up through one of my links, I will earn a small commission at no cost to you. I'm still really intrigued by all the different recipes you receive in your boxes. The beauty products in your last box sounded great, and I would love to make my own air freshener, hand sanitizer and linen spray. That's great that you make your own hand sanitizer. Yes! I LOVE using it! This is such a great idea, I didn't even know you could make hand sanitizer!! I am going to have to try this! I love how easy it is! I know! I had no idea either! I've never like hand sanitizes because of all of the crazy things in them, but this one could be so much better!! Yes, Jodie! I always tried to find hand sanitizers with the "most normal" ingredients... This makes me feel much better! Wow! That is perfect! I always forget bit and I hate it when I have been somewhere, like today in the hospital, and my hands aren t clean. And to make your own is so much fun! This is such a useful post Andrea and something I never would have thought about making on my own. My husband always carries hand sanitizer, but sometimes I hate how it dries out my hands, so I'd love to make my own and keep it in all my purses. Thank you so much for sharing and I will have to check out Simply Earth. I remember your post about the need of carrying lots of hand sanitizer when visiting San Francisco! ;-) This one really works for me. I never thought of making my own! I love the idea of using essential oils. Probably smells a whole lot better than the store-bought kind, too. Thanks for sharing! Having the box when you are out is a smart idea. And if you can make yourself products is great!! The recipes are really great and make me use essential oils in ways I never knew I could use them. I love essential oils. Guess I am an old hippie of sorts. I ordered myrrh, lavender and tea tree. Love mixing and creating different combinations. Thank you for the discount code. Oh, I would love to know what you'll use the oils you ordered for!